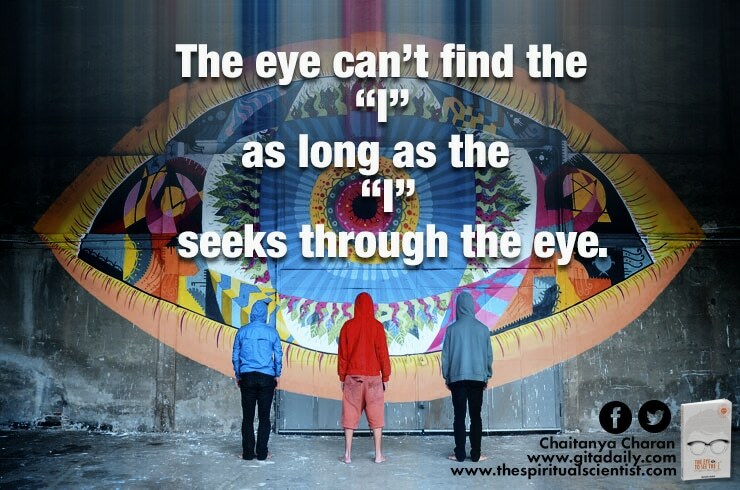 “The eye can’t find the I” means that the eye being material can’t perceive the real I, the soul, which is spiritual. “The I seeks through the eye” means that the soul’s consciousness searches through the eye, indicating that the consciousness is stuck at the material level. Suppose we have lost a key on a dark alley. We won’t find it by looking on a well-lit street, no matter how determinedly we search there. Where we search for a lost item needs to be determined based on not where light is available, but on where the item is likely to be. Unfortunately, this common sense principle is rarely applied to the search for the self. At present, we have become excessively infatuated with material things. Consequently, our consciousness has become so locked in matter that we can hardly perceive anything else. So whenever we search for anything, we search for it at the material level, for that arena alone seems well-lit. But the self, being the conscious perceiver of unconscious matter, is quintessentially non-material and can’t be found at the material level. Those who seek it in matter end up with myriad misconceptions about the self that are at best fragmented and at worst fallacious. The Bhagavad-gita (15.11) cautions that those not situated in proper self-understanding can’t perceive the soul, even if they try. To situate us in self-understanding, the Gita equips us intellectually and experientially. Its philosophical exposition of the self enables us to grasp spirit as a distinct category of existence, separate from matter. And its practical delineation of yoga enables us to purify our consciousness of its obsession with matter. If we let these gifts guide our search for the self, our search will culminate in blissful realization of our spiritual identity.